We have recently bought a few bilingual books (Portuguese-English) mostly because we struggle with finding Portuguese books. I was a little sceptical that these would be any good. I have never been a fan of them (without having ever bought any). My initial thoughts were that they would be a stupid literal translation of a book written in English and that the story, humour and cultural identity of the stories would be lost in translation. A little bit like Babel Dad explains here. I have never been a fan of translated books either and always like to read original versions when and if I can. Take this one for example. 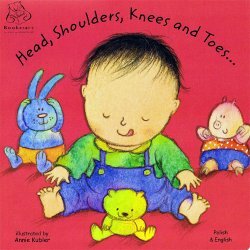 Head, shoulders, knees and toes is an English nursery rhyme. I would never buy it in any other language. What is the point? Sure, you can sing the song in another language and make the words fit the tune (tête, epaules, genoux et pieds, genoux et pieds...). But why not teach a French song instead? In my opinion, to be interesting, bilingual books have to be pretty culture-independent. 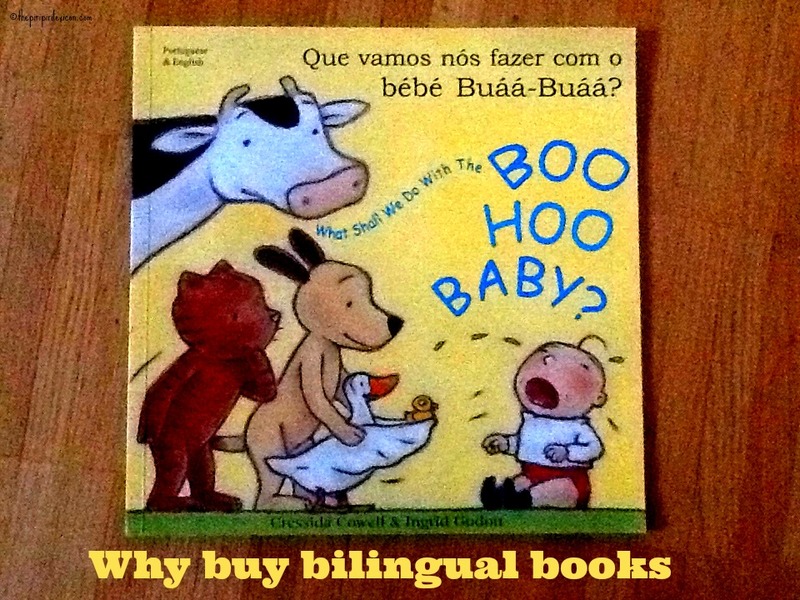 Yet, there is one main attraction to getting bilingual books. I (would) buy them for improving my child's vocabulary. 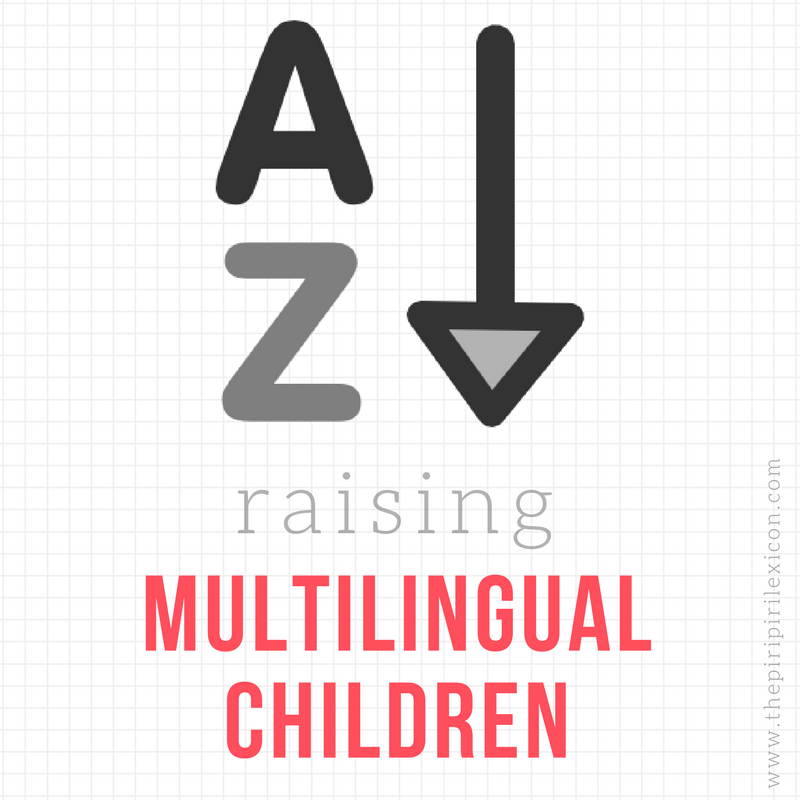 All bilinguals (adults and children) struggle at some point with expressing something in both languages. I explained here how I hate talking about my work in French. Reading the same story to your child in different languages gives them a larger vocabulary and the ability to talk about the same topic (that of the book) in both languages (provided you read the book in both languages - not at the same time). Giving your child the ability to expand their vocabulary and tell the story in different languages to different people is a great skill. Below you will find some reviews of bilingual books from other bloggers. On most of these sites, you will find other reviews too if you do a search. Have you got bilingual books? Please do recommend your favourite ones. I want to read the Gruffalo in Arabic! This is interesting... 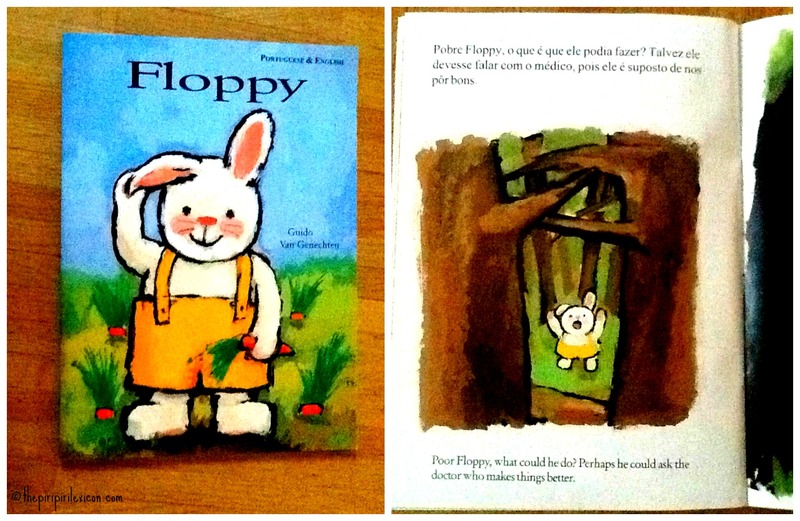 I've been considering buying my godson some bilingual books. His mum is a Germanphile (Germanophile?!) and being at the source, so to speak, it's my job to make sure he grows up with a love for all things German too. For his christening, I gave him one of those books that plays songs. It has 4 or 5 German nursery rhymes, and apparantly he loves it. Since you speak both languages, make sure the text sounds ok in both. There are so many bad translations. My little man enjoys when I read books to him in Spanish. I have noticed an increased vocabulary in Spanish as well. :) Thank you for including our Maisy's food (Spanish/English)post! Great post! Thanks for highlighting "Los tamales de Ana," and for linking up to Linky Lunes! You make such a good point here. I could not agree more that so many of them are awful, but that the one thing they really help with is figuring out how to express the same thing in two ways. Thanks for linking up with Booknificent Thursday! Looking forward to seeing what you’ve got this week! "Head, shoulders, knees and toes is an English nursery rhyme. I would never buy it in any other language. What is the point? Sure, you can sing the song in another language and make the words fit the tune (tête, epaules, genoux et pieds, genoux et pieds...). But why not teach a French song instead?" Yes yes yes! This is where we are reminded that multilingual living isn't just about learning language but culture. It's way more rich than simply living at the mercy of a (poor) translation. "Head, shoulders, knees and toes" in Dutch has been going strong for more than 40 years, to me it is a surprise to hear it has an English sister. And singing the song about the sheep and the 3 bags of wool in both Dutch and English makes me smile every time because the sheep changes colour in translation. Or is like shaun the sheep, a black sheep with white wool. Travelling to Australia in my late twenties, it made me smile to realise that Kangaroo Island is real, and not just a silly Dutch song. Maybe part of the Dutch culture is not so Dutch? And how many babies around the world have been falling asleep to Brahms' Wiegenlied since 1868? But I do agree on avoiding poor translations. I got these from Little Linguist (a UK site). They have a decent selection. I am also about to review more Portuguese language books. Watch this space.